Floating boom accessories, including buoys, anchors, and tow bridles, are products designed to aide with the deployment and installation of one of our floating barriers. These items can be used on most of our floating boom including our debris boom, oil containment boom and turbidity curtains. 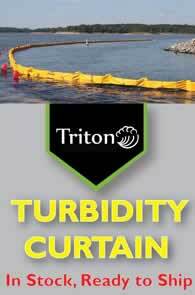 Protect your turbidity barriers and boom with Marine Accessories (PDF). One of the most common accessories for these floating boom are anchors and anchoring systems. Anchors are available in a couple of different weights including a 22 lbs., 40 lbs., and 65 lbs. anchors. Buoys are additionally available for use in anchoring and securing your barrier. Buoys are often used as part of an anchoring system to help anchor the barrier without placing additional strain on the bottom of the curtain. Tow bridles are another commonly used product for the installation and deployment of boom and barriers. Tow bridles feature a towing line and boom attachment to help redistribute the weight of boom for a successfully deployment in your location. Floating marker lights are designed for containment boom and floating barriers to help with cleanup operations and marine based jobs. Marker lights are built from PVC materials and feature a top marker light with D-cell battery. Tidal compensators are anchoring devices that allow turbidity barrier, floating boom, and curtain to keep up with changing water levels. Use them as a barrier or boom connector, anchoring to a secure point, such as a pier, dock, or piling. Reefing lines made from a black 5/16" poly twisted rope are additionally available. 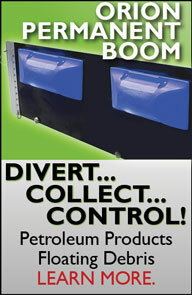 As mentioned above, these boom accessories are used on several different floating barriers including floating turbidity curtains, floating oil boom, and trash and debris barriers. The number of anchors needed, as well as anchor spacing is chosen based on the water conditions in your location.